Sometime in the not distant future, SeaWorld's orcas will be set free. Many, many people see this as a very good thing. But how it happens is critical. Consider the experience of Keiko. 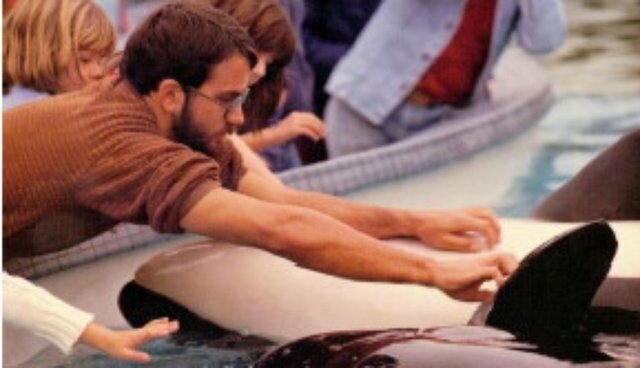 Keiko's path to freedom was initiated with the public swell of sympathy at the release of the movie "Free Willy" in 1993. In 1996, Keiko was moved to a much larger facility for recovery from his rather poor health and to begin re-learning how to catch live food himself. It was late 1998 before he was finally moved to Iceland. This process cost some $15 million, paid for mostly by some wealthy donors and a lot of small public donations. There was infighting over the nature of Keiko's rehabilitation, particularly over the issue of contact with humans. Throughout this time, the orca captivity industry dragged out the whole process by interfering with Keiko's transfer of ownership, trying to convert freeing Keiko into sending him to another facility, and then pushing to recapture Keiko and return him to captivity. As to the current situation, SeaWorld owns 29 orcas of which six are surviving wild born. Of these, Corky 2 alone was from the Pacific Northwest. The rest are all Icelandic. They constitute three pseudo-pods, whose elders are those who became too large to economically shuttle about. The wild born orcas experienced a couple of years of socialization in healthy natural pods. The rest have known nothing but life among humans, fractured families and turbulent tank life, with violence commonplace and constant shuttling between the facilities and pseudo-pods. The original protocol for Keiko's release was developed from experience with the release of other previously wild cetaceans. There is no precedent for the release of a bonded, heterogeneous group of orcas most of whom have never known the wild. While arguably healthier than Keiko was initially, the SeaWorld orcas are quite inbred from a small number of individuals, some of whom came from ecotypes sufficiently distant that they might be considered different species. The cost of Keiko's release shouldn't be used as a standard to measure future efforts. A rehabilitation tank, like the one in Oregon that held Keiko, is not needed, and the sea pen in Iceland was far more elaborate than needed. Of course now we're dealing with multiple orcas so there would be some infrastructure, but mostly for the human staff and logistical support, or to accommodate the public, but the whales only need a protected, clean bay or cove and an anchored net, plus a slide out, which could be a sandy beach. The overall costs might be in the tens of millions. What would be SeaWorld's exit strategy? How SeaWorld might be induced to set the orcas on their path to freedom could be quite variable, resulting from financial and/or legal necessities. If California's AB2140 passes in 2015, the ten orcas at SeaWorld San Diego, one of the pseudo-pods, would need to start this process. Under this bill, SeaWorld must fund the rehabilitation. Once the law is passed, SeaWorld would be forbidden to export the orcas. If passage seems likely, however, mightn't SeaWorld begin transferring the orcas to Orlando, San Antonio, and foreign marine parks? While capture and importation of orcas are highly regulated, export is a minor formality. Another foreseeable possibility would be that SeaWorld's revenues and stock prices continue to fall, the stockholders win their lawsuit, and SeaWorld goes into bankruptcy. SeaWorld wouldn't have the cash flow to continue operating those expensive orca facilities. Again, orcas are sold to foreign facilities to pay off SeaWorld's creditors. A variety of individuals and organizations came together to affect Keiko's release. SeaWorld's orcas need such a dedicated group focused on this bigger and more complex problem. A coherent plan could be needed in short order. By way of introduction to the authors of this article, Howard Garrett co-founded Orca Network and was involved in the early planning stages of Keiko's release in 1993. Co-authors Robert Anderson, Russell Hockins, and Robyn Waayers, in the early 1980s, each separately visited SeaWorld in San Diego to see the whales and dolphins there. We found that four of the orcas were rotated into the dolphin petting pool, allowing virtually unsupervised physical contact with these whales. Our accounts of those encounters can be found here. These interactions with newly captured orcas gave us profound understandings of the cognitive capabilities the orcas demonstrated. We each felt tested and our intentions probed by the orcas, and that the orcas not only learned our limits and abilities, but seemed to have shared their knowledge of us with their tank mates. We felt they became friends we knew well and that we became well known by the orcas. Each of us was deeply moved and intrigued by these moments with relatively untrained orcas. We were motivated to pursue scientific knowledge of orcas and current theories of their intelligence and capacity for building trust and social bonds. In the past two years we have established contact with one another to share these experiences and insights, and now we'd like to combine our understandings with Howard's to help answer items 2) and 3) above: how to design sea pens and protocols for rehabilitating captive orcas. In regard to sea pen protocols, we don't believe it is necessary to construct entire sea pens as a unit. Rather, the best locations are natural bays and coves with sufficient depth and dimensions netted off to accommodate the orcas for at least the short term. It will be important to have the ability to divide the pen for various purposes, and to expand the dimensions when the timing seems appropriate. The selection of individual orcas to transport in what sequence will be important but will need to be made on a case by case basis, keeping in mind that some sort of social bonding of tank mates tends to form over time and should be maintained unless there is recurring hostility or aggression, in which case those individuals may need to be separated. We believe it will be important to assign a team of human companions for each cetacean, available to them to interact with 24/7/365 on their time schedule/need. It would provide stability in the human/cetacean relationship that has not been there during captivity. The orcas should have some say/control over the interaction rather than have them always controlled by humans. The humans would likely be chosen by the cetaceans as well. Their rehabilitation will not only include learning to catch food on their own but also healing the effects of fractured family life and dysfunctional tank life, caused by a litany of management practices. To name a few: premature separation of mothers and calves, constant moving of individuals among facilities, and breeding females years earlier than occurs in nature. The emotional and psychological damage among the individuals is likely quite variable, with Tilikum representing the extreme end. It is unclear how many of these orcas can revert to a healthy mental state. The example of Keiko provides hope that many could. Keiko apparently never found or made contact with his matriline and was not adopted by any of the dozens of orcas he approached and accompanied for short periods in Iceland, so he returned to the company of humans. Only a few of SeaWorld's orcas are surviving wild born, and they are now the elders of their pseudo-pods. The rest have known nothing but life among humans and are descended from a cross-mixture of wild pods. Whatever their communications may be among themselves, it is likely a polyglot with respect to the wild pods. Over the years, it is likely that healthy pods will form having both bonds with humans and growing connections to the native wild pods of the region. When these orcas are in the open ocean, they should be afforded all the legal protections of their fully wild cousins. When in the sea pens, humans and orcas should be allowed to interact subject only to respectful constraint. This would be a tremendous opportunity for the two species to learn about each other, and an additional reason for humans to learn to live sustainably, sharing the earth with its other native intelligences.